Health Secretary Jeremy Hunt has said he is "disgusted and appalled" at accounts of patient neglect at a hospital in Worcestershire. It was claimed in one case an 84-year-old man starved to death at Redditch's Alexandra Hospital in 2009. 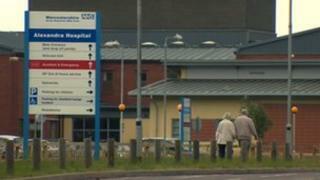 Worcestershire Acute NHS Hospital Trust will apologise to the families of 38 people and many will receive a payment of, on average, about £10,000. In a statement, the trust issued an apology over its "shortcomings". The incidents happened between 2002 and 2011, with 35 cases brought against the Alexandra Hospital and three against the Worcestershire Royal Hospital, Worcester. Lawyers for the families started a class action against the trust 15 months ago, after failings in basic day-to-day care were highlighted in a report by health watchdog the Care and Quality Commission (CQC). Inspectors concluded the trust was breaking the law in failing to meet "essential standards". Health bosses at the trust agreed in November to write to each of the families apologising for lapses in care, but have not admitted legal liability. The financial payments will total £410,000. Lawyer Emma Jones, who brought the legal action, said the failings uncovered were "appalling". Some patients treated by the trust were left thirsty with drinks left out of reach, while others were left to sit in their own excrement, she said. A man was unable to feed himself and nurses would simply take his uneaten food away, according to his daughter. There were further claims from the families of a man whose ribs were broken while hospital staff tried to lift him and a great-grandmother whose hip fracture went undetected by doctors. Former nurse Patricia Brindle, 86, was left unwashed for 11 weeks despite her son Peter begging nurses for her to be bathed, he said. Mrs Brindle, from Redditch, was admitted to the Alexandra Hospital in 2008 after a suspected mild stroke. She was transferred to another hospital but died a few days later. Mr Hunt said: "I am disgusted and appalled to read these accounts of what patients and their relatives went through. "These are examples of the sort of 'care' that should simply not happen in the NHS and there is no excuse for them. "We will be keeping a careful eye on this situation, and will take further action if necessary." Ms Jones said: "The most shocking thing about these cases is the fact that they went on over so many years, despite repeated assurances given from the management of the hospital. "Families who complained were told that changes would be made so others would not have to endure these kinds of failings but, in fact, the problems were not tackled. "Although the issues went on for almost a decade, we are pleased that the current management seems to be taking the matter seriously and making changes, and righting wrongs." In March 2011, CQC inspectors arrived unannounced at the Alexandra Hospital and concluded the trust needed to improve care. The trust said in a statement: "Whilst the trust has accepted that certain aspects of the care afforded to some patients fell below the standard that they were entitled to expect, all of the cases cited are several years old, in many incidences, more than a decade old. "A number of very serious allegations made by the families of deceased patients are not borne out by the medical records. "Nevertheless, the trust accepts that the care afforded to some patients some years ago - between 2002 and 2009 - fell below the requisite standard and has apologised for the shortcomings." It said that following an inspection by the CQC in early 2011, "significant changes have been made to ensure patient care is excellent".